The reason I have jumped at the chance to tell this story about M.U.S.C.L.E. 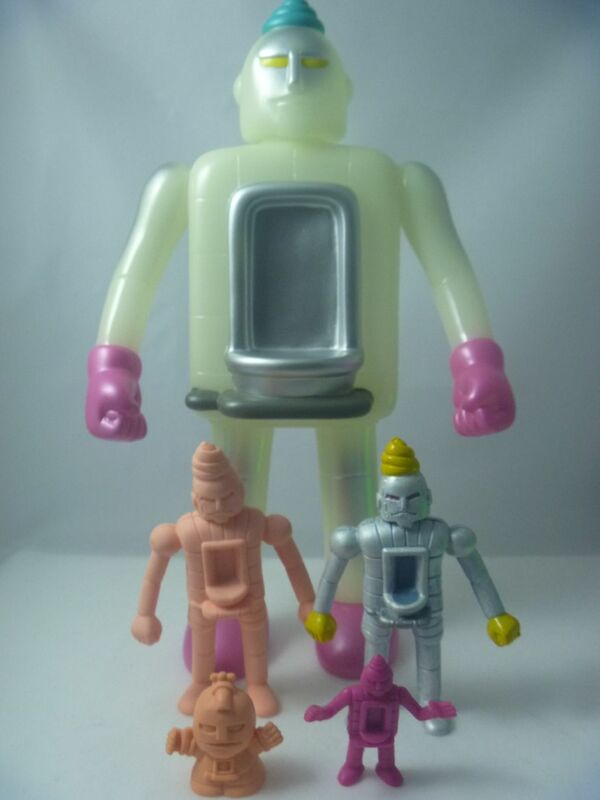 figure #44 (Benkiman or Urinalman) is because I recently came across a 5 Star Kinnikuman Benkiman piece – which is a story itself, as this figure doesn’t often appear across many Kinnikuman products. He probably doesn’t appear because Benkiman generally has a turd on top of his head! Sometimes it is a tap but mostly it is a runny looking turd. Back to the 5 Star piece and why I instantly wanted one. 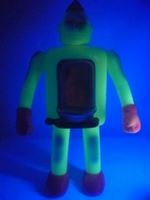 This particular 5 Star piece glows in the dark! I have a soft spot for toys that glow in the dark. My collection features pieces from toy lines like MOTU, WWF, McDonalds, MIMP and the Funko line of products. 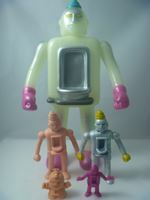 The Kinnikuman 5 Star set me back $120, but he was well worth it. I’m not sure why the turd on the top of his head is blue. It does make me chuckle to think of what could turn a turd that color. 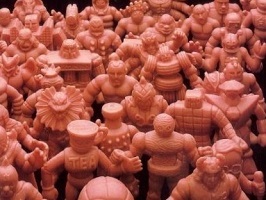 Of all my Class A Magenta M.U.S.C.L.E. figures, the #44 figure is my favorite. Just another reason I’m a fan of the Benkiman. I also had a custom painted Deka Benkiman created for my collection. It is quite similar to how the character appears in the Kinnikuman cartoon. His appearance in the cartoon involved him trying to flush Kinnikuman down his basin in battle, only for Kinnikuman to block the pipes with his underwear so that he survives. Quite a funny thought. Lastly, I have recently tracked down an SD Benkiman, which is one of the toughest figures to find in the 84 figure series, leaving me with three figures remaining to find. This entry was posted on Monday, August 10th, 2015 and is filed under UofM News. You can follow any responses to this entry through RSS 2.0. You can skip to the end and leave a response. Pinging is currently not allowed. Nice! That GITD Benkiman is boss! I like it. Part 7 SD’s are really tough to get. I myself need 5 figs to go.